Having a horse ranch means a lot of joys, but it involves certain equine caring. One of those is horse flies. The terrible insects carry equine infectious anaemia, also known as swamp fever. Their bites cause momentary pain and relentless itching for your hoofed fellow. The best horse fly spray appears as a solution for this irritation. Here we have the top 5 best horse fly repellents carefully selected. Hope one of them will match your need. Why do flies keep disturbing my horse? How do you choose a fly spray for your horse? 1. Do pyrethrins actually kill the insect? 2. How often should I spray the horse? 3. How long can the spray stay on the horse? 4. Which type should I use? Pesticides or Repellent? 5. 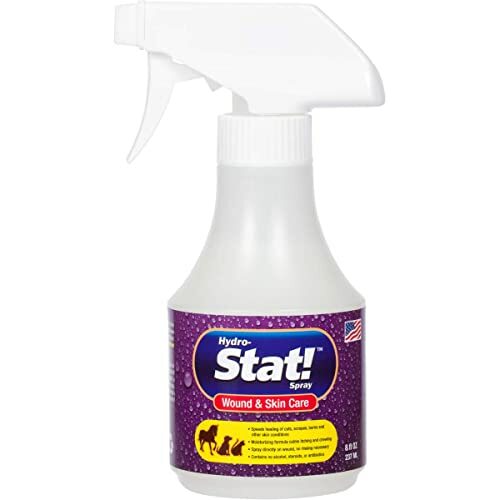 Can horse fly spray repel fleas? 6. Can horse fly spray repel bots? 7. Will the spray promote hair regrowth? Cattles are always in favor of flies. That includes the horses. There are molecules dwell on horse’s hair that appears to be tasty to these despicable insects. Thus, these bugs enjoy scavenging on the horse body to have their feast. When they swarm over the horse’s face, they drink the fluid from the eyes. In the meantime, they also deposit bacteria onto the surface. It is also fly’s instinct that gets attracted to the dark color of the horse. The job of chasing off these flying bugs manually seems to be hopeless. That is when you need help from an industrial-grade product. 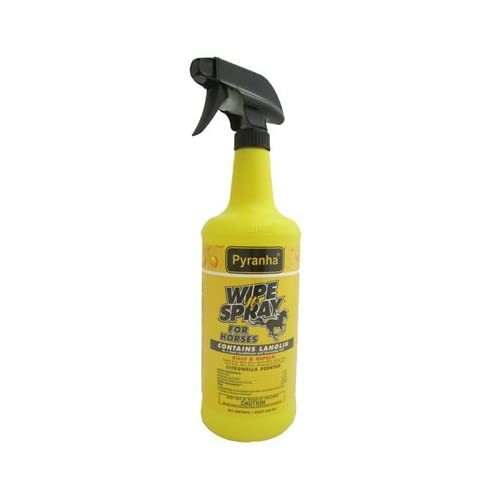 Using the pyrethrins-based formula, the Pyranha Wide N Spray is extremely friendly to your animal’s skin. You can apply directly to your horses worrying free. With just a few sprays and brushes, your horses will be protected from flies while remaining the glossy hair that many desire. We’ve been using the product on our barn animals (not just horses). It’s come so far with an appreciated efficiency. The flies got killed on contact and the repellent stayed for almost 24 hours. We believe this fly spray is perfect for daily basics during the fly season. There are claims that the products can cause side effects like allergies. So, you should test on a small portion of the hair before applying it thoroughly. But don’t worry too much because it is proven to be safe to most equine. For maximum effect, apply 1 to 2 ounces of the solution on one horse. Using too much of it would just be a waste. For the rainy and humid days, the Farnam Endure is an ideal option for your whining companion. The compound will stay active and keep working after being sprayed on the surface despite the unsupported environment. Moreover, it’s one of a few fly sprays that come with RepeLock conditioner which adheres to the hair shaft and stays up to 14 days of fly control. That helps your horse to stay active even in wet conditions or when he sweats. The product can protect your horse from insect bites of flies, gnats, mosquitos, and likewise. From our experiences, this competent product has a long-lasting effect. Better than that, it doesn’t come with any unpleasant smell. Wait until you meet the Absorbine UltraShield EX. The product is a weatherproof and sweat-resistant spray that adds up to 17 days of fly control. Not only dealing with fly, but the spray can also chase off mosquitos and ticks on an alternative. The plus point is it can repel mosquitoes that transmit West Nile virus on animals. Moreover, loading multiple sunscreens and coat conditioners in the formula, the Absorbine UltraShield EX is friendly on a wide variety of different skin types. It also acts as an effective skin protection compound. The spray works like a charm on horses. It can use on pets and other domestic animals. We made use of it on our Pitbull and helped him nap through his noon without any fly interfering. The Farnam Repel-X pe provides economical protection for your horses from biting and bloodsucking insects. It contains Prallethrin and Piperony Butoxide, two effective and skin-friendly chemicals that are recommended for dealing with files. Users can dilute the concentrated solution before use. One quart of liquid can be mixed with water to create 8 quarts of fly spray. That proportion should be enough to dispel fly and bluebottle. Like most pet-friendly spray, the product also works on farm animals. If your animals got bitten, the Stat! Spray can save the day. It enhances the healing rate and protects your animals from future wounds. Containing the Aloe Vera compound, the product helps to soothe itchy and hot spots while promoting hair growth. The Aloe Vera works great on reducing the pain and preventing horses from ruining their beautiful mane. It also keeps your gallop friend from feeling any discomfort. The HydroStat! Spray provides effective bacterial and fungal repellent, thus giving your horse effective treatments from badly wounded areas. Moreover, the eucalyptus help repels insects from continue hurting your animals. Developed and clinical proven, the product is harmless to the skin. It contains no alcohol, steroid, or any stimulus that makes it 100% safe on your animals. We highly recommend this product for your horse when dealing with itchy wounds. Flies are always a challenge for horse breeders. That is why we need horse fly spray to deal with them. The information below is essential if you’re planning to purchase the best horse fly spray. Repellents: These products often consist of chemicals or natural concentrate that create awful smell to counter the approaching flies. Insecticides: If the fly problem persists, then we’re forced to use a more extreme method. Killing the flies is typically a performance on a wide strike. Conditioners: Since you also care for your horse’s mane, some horse fly sprays consist of hair conditioner. Wound treatment: It is for healing bitten wounds. What is in the bottle matters if your horse is allergic to some of the ingredients. Is it natural or synthetic? Are there any allergens? And would be effective when dealing with certain types of insects? Pyrethrins: This is an organic compound that comes from chrysanthemum flowers. It’s a common insecticide that kills off flies by affecting their nervous system. Pyrethroids: It is referred to as synthetic pyrethrins, also an insecticide. The compound has a longer effect than organic pyrethrins, thus making it more desirable. However, this one is toxic to fish and other aquatic inhabitants. Piperonyl Butoxide: This one acts as a stimulus for Pyrethrins and Pyrethroids, so we often see it in many products. But when standing alone, it has no chemical effect. Oil: Concentrate oils are often used to deal with mosquitoes and give the spray comfortable smells. Remember to apply the solution in directions and don’t forget to wear gloves if you need to wipe the liquid. Make sure your horse has a bath before applying the fly spray, and you’ve tested the product on a small area on the animal. Always set the nozzle of your sprayer to mist so the compound can be evenly distributed. Moreover, give the horse more spray than you think he would need. This is because most horse fly sprays nowadays can last for more than 24 hours. Thus, it makes sense to give your horse more protection in case you don’t have time for daily care. Don’t spray directly on their faces. Instead, gently rub the chemical on it. We used a small piece of cloth to apply the solution on sensitive areas like the ears and near the eyes. Also, keep the nozzle away from the eyes since it would be harmful to your horses. In most cases, you should leave this area untouched. For the mane, we recommend using your horse brush for an equal spread. You can go for conditioner products to give the hair its gloss and keep that beautiful mane shiny and healthy. Lastly, always follow the manufacturer’s instruction to maximize your outcome. A: Not necessarily. In fact, the synergists in the formula paralyze the horse fly. After a while, the enzymatic action will detoxify pyrethrin, thus recover the insect. A: One spray may protect your horse from 2 to 3 days. Your horse will need a regular spray schedule. But if you’re not able to re-apply with frequency, we recommend using oil-based spray. We only have to respray the horse after 5-6 days. However, during peak season, you should do this daily to keep the flies from even getting near to your equine. A: Most sprays advertise to last 14 days, but in fact, only if your equine lives in an air-conditioned room with zero weather impact. Otherwise, high-quality spray can last up to 3 days. A: Repellents are considered to be eco-friendlier than the other one. Pesticides can annihilate the insects by chemicals but will leave pollution trace up the environment. We lean on the clean side and we advise people to do the same. A: Yes, most products can repel fleas on horses. But if you’re planning to use this on your dog or any other animals, it is necessary to test it on a small area first to avoid any unwanted accidents. Technically speaking, the product is useful when dealing with flies and also its offspring. The spray prevents the insect to lay eggs. However, if your animals already have bots, you should remove it manually instead of just relying on the product. A: It indeed encourages the hair regrow without discoloration. But the growing speed can vary in different animals. There isn’t a definite amount of time. You just have to keep spraying the area to stop your pet from licking his wound until it gets healed and starts to grow fur. Having a reliable horse fly spray should be one of your priorities when taking care of equine. 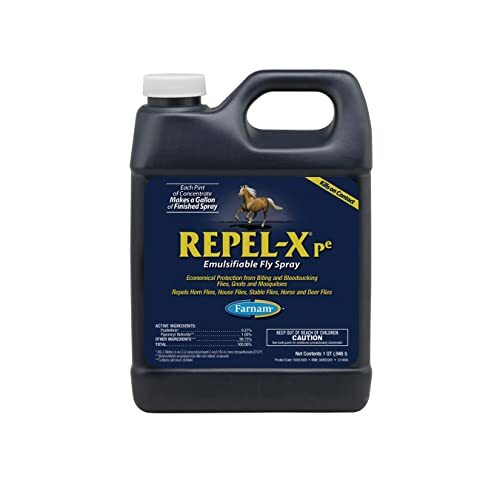 Although the products in our list are all on the top, we want to vote for the Repel-X as the best horse fly spray because of its effectiveness and reasonable pricing. More than that, the label from Farnam offers a safe solution for barn use and is available in various gallon sizes. Otherwise, the other choices are excellent alternatives if you can make use of them effectively. Choosing the right product to dispel the disturbing flies is a great way to show how much you care for your equine. Hopefully, you can benefit from our best horse fly repellent review and thanks for reading.